What Is the Healthiest Type of Apple to Eat? What’s that old saying? “An apple a day keeps the doctor away”, well that might just be more right than you previously thought! Many of us forget that when it comes to a simple snack or healthier lunchtime side the simplest of answers, such as an apple, are usually the best for us. So next time you’re feeling peckish, why not reach for that fruit bowl instead? The apple is the fruit of an apple tree, which are (not surprisingly) one of the most widely grown fruit trees. There are thousands of different apple varieties, including: Gala, Granny Smith, Pink Lady, Golden Delicious, Fuji and Red Delicious. The apple tree originates from Central Asia. Millions of tonnes of apples are grown each and every year for us to consume. China is the leading producer of apples across the globe. Other top apple producers across the world are the USA, Turkey, Italy and Poland. The average apple has around 130 calories, depending upon size and variety. The apple’s genome was actually decoded during the year 2010. Honey bees are commonly the pollinator of apple trees. The apple tree usually blossoms during the springtime and the fruits mature sometime within the autumn. Chemical sprays can be used to protect apple trees from a number of different diseases and pests, although organic methods are quickly becoming more and more popular. The saying ‘An apple a day keeps the doctor away’ is thought to originate from Wales during the 19th century. Although this may not be entirely true, the apple does have various health benefits which could potentially make a doctor’s visit less likely! While many apples are eaten fresh, they can be used within recipes -especially the varieties which are more sour in taste called ‘cooking apples’. The apple tree takes around 4 to 5 years to produce their first fruits. Apples are actually a member of the rose family, who’da thought? It would take 36 apples to create roughly one gallon of apple cider. The largest apple that has ever been picked weighed 3 pounds total. The apple contains no fats, sodium or cholesterol making it a very healthy sweeter snack -especially as they are full of fantastic dietary fibre. If an apple is left at room temperature they usually ripen around 6 to 10 times faster than if stored within a refrigerator. These facts are sourced using the websites Science Kids and Farm Flavor for your educational pleasure. Each variety of apple has it’s own health benefits and uses, in terms of the recipes it fits well within and the way it can be eaten (raw or cooked). What are the general health benefits of eating apples? When biting and chewing apples your saliva glands are stimulated to produce more of the substance, and thus reduces the likelihood of tooth decay by lowering high levels of any bacteria present. Although, apple’s cannot replace the need for a toothbrush they can certainly help during the day when brushing your teeth may be inconvenient or impossible. Studies conducted on mice have recently shown the impact of apple juice upon the prevention of Alzheimer’s disease. Mice who were fed the juice tended to score higher on maze tests, as well as displaying a higher quantity of the neurotransmitter acetylcholine. The antioxidants present within apples certainly can help to curb the free radicals within the body that cause cancerous cells to form. In some cases, this can be up to a 23% reduced risk in terms of pancreatic cancers. Evidence shows that individuals who consume fruits (such as apples) and other fibre rich foods frequently, are much more protected against illnesses such as Parkinson’s. Likewise, a result most likely caused by the free-radical fighting effects that the antioxidants of the apple contains. 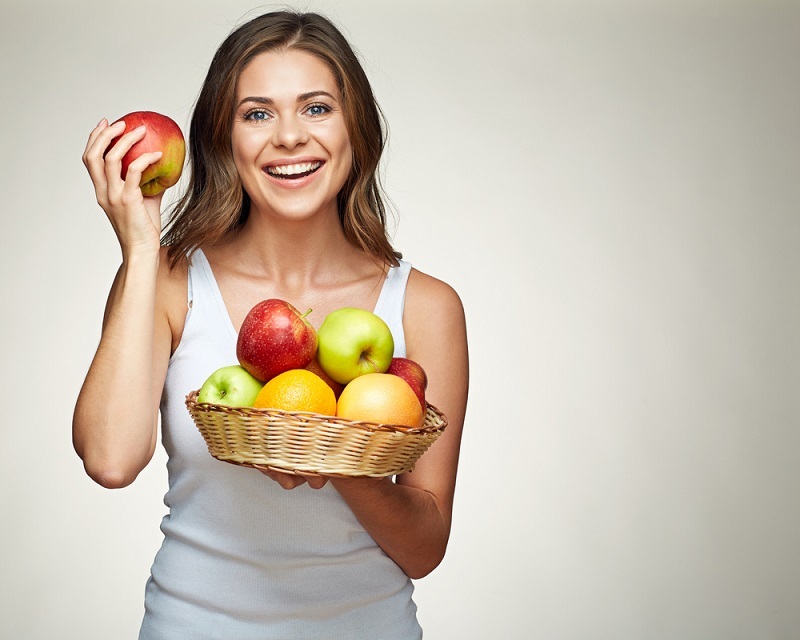 It has been said that women who eat one apple per day, actually have 28% more protection in not developing type 2 diabetes. Due to being loaded with soluble fibre, apples can work perfectly in avoiding the body’s blood sugar levels from spiking. The soluble fibre found within apples can bind with the fats inside your intestines and result in lower cholesterol levels, benefitting the body in numerous ways! Compounds found within the apple can aid in avoiding plaque build-up inside your arteries, thus avoiding coronary heart diseases as a result of the reduced blood flow. So, apples may actually help prevent heart disease! When trying to prevent gallstones, doctors recommend a diet which is high in soluble fibre -which is exactly what apples provide! Try consuming at least one apple per day if you are prone to gallstones and hopefully you’ll see the difference in no time. As previously mentioned, the apple is loaded with the fantastic soluble dietary fibre needed for a healthy digestive system and healthier stools. Working in one of two ways, fibre can either aid with constipation or treat diarrhea for the consumer. When trying to control the symptoms of irritable bowel syndrome or IBS, it is advised you avoid dairy and fatty foods -instead replacing them for foods high in fibre. Try replacing your favourite dairy products (such as milk or yoghurt) with either drinking apple juice or eating an apple itself. Fibre, fibre, fibre! We’ve been relentlessly mentioning this miraculous important dietary need over the past few health benefits, so here’s another positive -weight control. When consuming fibre you are much more likely to stay fuller for longer and this, in turn, avoids unnecessary snacking and calorie consumption. So, next time you’re feeling hungry in between meals why not try a tasty apple instead of those potato chips? The red varieties of apples contain a substance called ‘quercetin’, which is found to be a useful immune booster when consumed regularly. Opinions may be divided on this matter, however recent long-term studies are showing that consuming fruits high in antioxidants (like apples) can reduce your chances of forming cataracts of up to 15%. And the Healthiest Type of Apple Is? We all have our personal favourites when it comes to apples, some may like the good old trusty Granny Smiths whereas others may prefer the likes of the Red Delicious -but which is the most beneficial to our health? Research has found that the compounds found within the classic Granny Smith variety of apple may help to prevent disorders associated with obesity, even if the apple wasn’t linked to any specific weight loss effects. When testing the apple varieties: Granny Smith, Fuji, Braeburn, Golden Delicious, McIntosh, Gala and Red Delicious researchers found that Granny Smith apples contained the most nondigestible compounds as well as a high fibre and polyphenol content. This high fibre and polyphenol content is said to promote the growth of good ‘friendly’ bacteria inside the colon, perhaps even enough to prevent some obesity-related disorders. One Canadian study found that the Northern Spy, Ida Red and Red Delicious are some of the best apples in terms of their antioxidant contents, noting that the polyphenols of these apples were found mostly within the skin of the fruit. In terms of the best apple for disease-preventing antioxidant contents the Red Delicious certainly ranked the highest, neutralizing many highly reactive free radicals which can cause cancers, Parkinson’s, Alzheimer’s and various other health issues. Contrastingly, a different study conducted in 2009 found that when testing 15 different varieties of apple, (12 organic and 3 conventionally grown) the organic Pendragon apple was placed at the top spot. The tests conducted upon these apples were ones in which the various plant compounds present were looked at for their health benefits, the apples overall nutritious content was measured and not only was the flesh looked at but the peel too. The Pendragon apple has a similar colouring to that of a crab-apple. While these apples may of won in their own studies, it is important to realise each variety of apple has it’s own health benefits, specific taste and strengths. If you are considering which type of apple is best for you and your family, it may be wise to try your own taste-tests on the apples which appeal to you most as well as taking into account your personal preferences. For example, do you prefer ‘healthier’ organic fruit or the non-organic varieties which have been protected by various pesticides preventing damage to the apple crops as a whole? We here at Balance Me Beautiful simply recommend choosing organically grown apple varieties when in season from local farmers, as in doing so you are supporting your local community and preventing the consumption of harmful toxins that can be found within non-organic fruits. If you are interested in consuming conventional non-organic apples, it may be best to not consume the peel, keeping in mind that the apple is rated one of the highest produces to be left with the most residual pesticide content after being treated. Store your apples in the refrigerator if possible, in order to prevent premature ripening as well as preserving their sweet and tasty flavour. Adam’s Pearmain apple: This apple is described to be both ‘nutty’ and ‘sweet’ in flavour. Adanac apple: A medium-sized yellowy green apple, which is actually just Canada spelt backwards in name. Red Delicious: Originating from Peru, this apple is supposedly crunchy and mildly sweet to taste and is in season throughout August to July. Granny Smith: Coming from Australia, this apple variety is a favourite for snacking known for it’s tart and crunchy flavour. Alexander apple: This type of apple is an old variety which, when cooked, becomes a puree. Arkansas Black apple: This apple goes an almost black colour in storage, hence the name. Apricot apple: A lesser-known apple variety which is characterised by it’s apricot-like taste. Golden Delicious: The golden delicious apple has a sweet, mellow taste which when sliced stays white for longer than many other apple varieties. Perfect for many recipes both savory and sweet. Gala apple: In season throughout August to July, the gala apple is fantastic in both pies and salads alike. Fuji apple: This apple is known for its super sweet taste! Honeycrisp: Good for freezing and excellent for all manner of things from salads, to baking to sauces this apple variety is a winner for sure. Cripps Pink apple: In season from November to July, the cripps pink apple has a sweet but tart flavour great for snacking or baking with. Braeburn: In season from October to July the braeburn apple has a bold flavour, and varies from orange to red in terms of colour. Breeze apple: With an aromatic and sweet flavour this apple has a pretty pink and yellowy colour to it. Jazz apple: Uses include snacking, baking, salads, beverages, pies, sauces and these apples can even be freezed. Lady Alice apple: A fantastic name for a fantastic apple, this variety is in season from January to May. Opal apple: This apple is crispy and juicy-sweet! Sweetie apple: Sweet, crisp and full to the brim with flavour the sweetie apple is cute in both name and taste. In season from September to October. Kiku apple: In season all year round and originating within Italy, this apple is said to be exotic, juicy and to have a super-sweet taste. Whatever apple you decide to chow down on, or include within your recipes we hope our article and research will be of some help to our readers! Maybe the best way to operate when choosing your apple variety is to determine the taste and uses of the type of apple you need and then pick one which suits! We here at Balance Me Beautiful appreciate hearing from our readers, so feel free to let us known in the comment section below your favourite varieties of apples! Alternatively, if you have a query, question or future article suggestion you can contact us via our Contact Page. As ever guys, thanks for reading and don’t forget to see us again soon.